I was lucky enough to be able to travel to many amazing cities and countries during my time abroad. Of course, I made sure to visit the big 3: London, Paris, and Rome. I have been dreaming of visiting these places (especially Rome) ever since I can remember. Luckily, flights out of Barcelona are extremely cheap, so it really didn’t cost very much to make these dreams into a reality. My first stop was London. London is way bigger than I ever would have imagined. It even has 5 different airports, which made traveling to and from London quite an adventure since we used different airports for the two flights. The airport that we flew into was about an hour outside of the city center, so we had to take a train to get to our hostel. The suburbs of London seem to go on forever, which makes sense considering there are over 8 million people living in greater London. 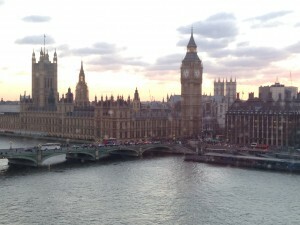 I spent 4 days in London, and I could have easily spent another 10. There are so many things to see and do, and so I had to be picky about what I wanted to accomplish during my 4 days. My favorite things to do in London were riding on the Eye of London (a gigantic ferris wheel on the Thames river that provides perfect views of the city center) and touring the Parliament building. Unfortunately, the food really isn’t very good in the UK, but the attractions more than made up for it. Next up was Rome. Luckily for me, my study abroad provider included a trip to Rome in the costs of my program. Staying in a hotel was a nice break from all of the hostels I have stayed in during my time in Europe. I have always been fascinated by Roman history, thus finally experiencing Rome was amazing. I was overwhelmed with how big the Colosseum actually was. My favorite part of Rome was the Vatican. We toured the Vatican Museums and the Sistine Chapel, and on Sunday we actually got to listen to the Pope speak from St. Peter’s Square. Lastly, I can’t forget to mention the food. Authentic Italian food is something that everyone must try at least once in their lifetime. It was incredibly difficult choosing what to eat because there were so many delicious options, and the portions were gigantic. Rome is my favorite city that I have visited thus far. A few weeks later, I traveled to Paris for 4 days, and I stayed in a hostel in the Montmartre part of town. Montmartre is the very stereotypical part of Paris: lots of artists wearing berets and painting pictures of nature. 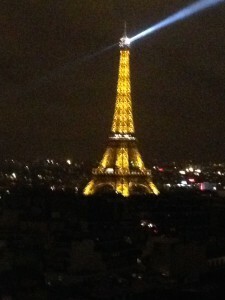 Similarly to London, it was extremely difficult to see everything that we wanted to see while in Paris for only 4 days. We took a day trip to the Palace of Versailles, which I would highly recommend to anyone who visits Paris. Versailles was also very cool to see since I knew the history behind it. Unfortunately, the gardens were pretty much nonexistent since we visited while it was still Winter, but I hear they are beautiful. Of course, we also visited the Eiffel Tower, Notre Dame, and the Louvre. My favorite though was the Museum d’Orsay, which is an art museum. It isn’t nearly as big as the Louvre, but I think that makes it a little more fun to see. When we visited the Louvre, it seemed like we were practically running to be able to see everything, but the d’Orsay has a smaller collection of extremely impressive paintings. The food in Paris was good, but not as good as in Rome. I tried macaroons, but oddly enough, I didn’t really care for them.